I know this episode gets a lot of flack, but I really admire the intention of what they were trying to do: to make John come face-to-face with his new reality, and the alienness of his experiences from here on out. It's one of those A for effort, C+ for execution episodes. I think my favorite moment from this episode is the scene where Aeryn and D'argo are in the tree bonding over how Crichton is pathetic. Its a nice preview of their relationship for the rest of the series. It also guides the viewer into making assumptions abut the selfishness/selflessness of certain characters, which will be readdressed a few episodes in, for example in DNA Mad Scientist. I thought it was a fair episode, but with ideas that probably should have been divorced. Part of the attraction of the planet to John was how familiar it felt to him, but an underlying theme was how he was still quite alien in a place that seemed like home. His role as an alien being a reinforcement of his new circumstances, as sardonyx mentioned, but the similarity to Earth aspect probably could have been saved for later in the season when he would presumably be missing home so much more. The episode had a small touch of the Star Trek: The Next Generation episode, "First Contact," which deals with an alien race meeting another alien race for the first time, in the role of said race, being humans. Was this the first time we had mentioned the Six Forbidden Cargoes for leviathans? For some reason, I love the idea of forbidden cargoes. In this case, though, it kind of served purely as a MacGuffin with it's final introduction coming belatedly in the episode (though, plus one for Rygel tasting the stuff). I've always had something of a love/hate relationship with Zhaan. Sometimes I love her character and sometimes, it just seems the writers like to provide her mystical abilities out of the blue...er, in the blue? In this episode, it just seemed a bit too far that she could take the pain of giant creature, pain severe enough to kill Moya, without suffering more serious problems than simply passing out. Props for the visual cue from E.T. with the dark figures and flashlights hunting for the alien. Ironically, while John manages to leave the planet, like E.T., he doesn't get to go home. Or call home. In fact, he has to go directly to jail. By jail I mean prison ship. Thanks, I'll be here all night! I never understood the criticisms of this episode, but rewatching it again, it really had a very slow pace to it. It's a fun idea to explore. But the pacing was really slow, and the score didn't seem to quite fit (for me anyway). Of course, one of my biggest gripes about rewatching Farscape is the score. Sometimes it's perfectly serviceable, but sometimes it just screams cheesy. I have a dream of figuring out how to separate the score from the voices and sound effects and rescoring it. Of course I know nothing about how to do that and have more projects than I can possibly keep up with. But rewatching the first two episodes reminded me I want to do this. Am I seeing D'Argo with two different eye colors in some shots? I know he had colored contacts to start and they came out later, but I swear it varied in a few scenes. I always roll my eyes about this episode, but watching it carefully for this rewatch, I realized I'm too hard on it. I usually think of the plot as a little too SG-1 (not that I don't like SG-1) but it has a lot of nice moments and it's amusing to see Crichton try to reassure someone about an experience that he just went through and is still freaking him out. I think most of my problems center around hos much I dislike the makeup on the planet residents, as well as being annoyed by the curly-haired moppet. 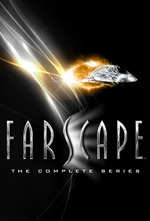 I've never seen Farscape, but it's been on my to-watch list forever. I'd like to follow along with the rewatch, but is this the sort of show where the first watch experience is significantly better unspoiled? but is this the sort of show where the first watch experience is significantly better unspoiled? I would say yes because there are plot twists, character reveals and sheer insane WTF moments ahead. 2ht: I would say it might be best to not read the comment threads here, since this is a rewatch, some spoilers that you really don't want to know before you see it. I'd love to get your take as a new watcher though. If there are a lot of newbies and first-timers watching, I'm sure the rest of us can be respectful enough not to drop any major spoilers. It seems so far everybody is being very careful not to let the cat out of the bag. I mean I don't think it spoils anything to say the writers didn't seem to know how to handle Zhaan (very true) or that Moya and Pilot have a complicated relationship (also true)--although feel free to correct me if I'm wrong. I'm betting we can keep this up, at least until things start to get really, really crazy. But if even that level of spoiler is distracting for you, then definitely watch the show without any outside influences. It really is worth it to come to it with no foreknowledge. I'd like to be able to discuss some spoilers as it would be nice to delve deeper into some of the stuff that happens with an eye to how it relates to future events, but I'll defer to the majority. Of course I'm willing to defer to the will of the majority. If most MeFite Scapers want spoilers, I'm fine with that. I just thought I'd put it out there as a point of discussion. We have the ability to set the tone now, so we may as well take it. Thanks for the tip. I'm not afraid of spoilers for a lot of shows, but sometimes when there are big plot twists and mysteries and character reveals then it's just better to go in knowing nothing. Sounds like Farscape is that kind of show, so I'm going to bow out of here and watch it on my own time. Just please make sure you feel free to pop back in if one of the twists really throws you for a loop. There are a few that can really leave the viewers scratching their heads, causing them to ask, "What the hell did I miss? Did I skip an episode?" The answer will usually be, "No you didn't, things will be explained in the future," but believe me, it would have helped to have somebody on hand to offer that reassurance. And if you want to tag along for the first few episodes, just to get your feet wet, I'd say don't worry about the spoilers. Even if we start talking about stuff to come, it likely won't make any kind of sense to you, so it will just be like white noise going in one ear and out the other. Trust me, even if we start dissecting Harvey's or Jack's characters, you won't have a clue what we're talking about. There are some episodes near the end of the first season that might have a slightly confused order. I watched it on the DVDs, and I think they put them in an order that doesn't make sense chronologically. Is that worth warning people about? And is someone more certain than me what exactly I'm talking about without me being more specific about what makes the order important and thus spoiling something? Is that the right order? I'm basing this off the Farscape World episode summaries and fuzzy memories since I haven't watched this in a few years. Yes, that's the correct order. I pulled the first season episode titles from Wikipedia and listed them near the end of the Fanfare talk thread about Farscape, so people didn't have to see the episode summaries at Wikipedia if they didn't want to. I didn't dislike this episode, though I did think it felt very Star Treky in a way that the previous episode didn't. Possibly because of the whole "civilization which is basically Earth but not" thing, which was mostly not the case in the last ep. I wonder if that's the reason it was originally aired later in the season? I was also horrified at the hack job Rygel was doing with that knife and I'm amazed he didn't accidentally lobotomize the ship.